This publication investigates how, where, when and why the Neo-Georgian has been represented over the course of the last century. It assesses its impact as a broader cultural phenomenon through a consideration of its buildings, objects, institutions, and actors. It contends that this was not another dying gasp of Revivalism restricted to 1920s Britain but a complex assertion of national image and identity with its origins before and its influence extending beyond this ’lost’ decade, well into the post-WWII period. Different ideologies have been attached to the Neo-Georgian at different times and places, particularly notions of home, nation, gender and class. The papers explore the construction, reception and historiography of ‘the Georgian’ throughout the late nineteenth and twentieth century – and most particularly its relationship to modernism – through discussion of a range of building types, planning (including the new concept of Civic Design) and design generally. The expansion of the public sector in the twentieth century saw Neo-Georgian embraced for a wide variety of buildings and sites. Re-interpretations and adaptations of the Georgian have been a constant theme over the past century and constitute a powerful and enduring strand in Anglophile culture across the globe. The papers consider interpretations of the Neo-Georgian not only in England but in places as diverse as New Zealand and America. 11 Neo-Georgian: the other style in British 20th-century university architecture? Part IV: Neo-Georgian; a prelude to Modernism? The book is splendidly illustrated throughout with historic and contemporary photographs and drawings. Between them the authors make a timely call for a more balanced view of 20th century architecture. 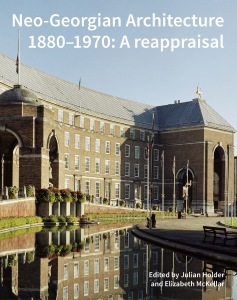 The book will be of interest to architectural historians but it has a much wider appeal in making a case for a widespread but often underestimated architectural style. Historic England has excelled itself with a publication that takes a fresh look at a style long viewed as little more than a profanity ... Ne-Georgian Architecture 1880-1970 offers the start of a fuller understanding, sketching out the style's appearance as a plaything of 1920s elites before its municipal heyday ... This is a publication that should open eyes and, hopefully, result in a full monograph. It remains to be said that Neo-Georgian Architecture is handsomely produced and contains excellent pictures, few of them published before. It reflects credit on Historic England as well as its authors and editors. This is a fascinating and tightly organised collection, which functions well as an illustrated survey while also providing ways of understanding the shifting discourses and contexts within which the Neo-Georgian has been conceptually constructed over the long timeline established by the editors. It is also a strong demonstration of the way architectural history can work as a collaborative enterprise, capable of addressing significant gaps in both intellectual history and practical knowledge. ... the cumulative effect of these studies is highly constructive, and the positive advocacy of the Neo-Georgian as something far more complex than pastiche .... is well judged. The book works convincingly as reappraisal of a mostly default style that has never been subjected to consistent and clear critical appraisal, and has had to endure very many insults. ... the book's chapters offer a compelling overview of the subject, with common threads connecting them. ... By initiating a long overdue conversation on the merits and drawbacks of the Neo-Georgian style, this book paves the way for further consideration of the subject.